TV and hi-fi discounts from Richer Sounds | What Hi-Fi? 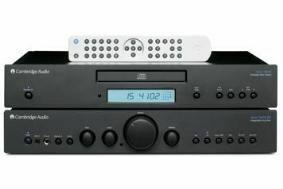 Well, Richer Sounds is this week offering its VIP customers the Cambridge Audio Azur 340C CD player and 340A SE amplifier (both five-star products) with free Gale Silver Monitor speakers and Cambridge Audio ID10 iPod dock for £370, a saving of £100. Other discounts on offer from Richer this week include a Samsung LE32B450 32in LCD TV for £350 (save £150), a super-slim Hitachi UT32MH70 LCD for £270 and a Samsung SM2032MW 20in LCD for just £150. Sony's BDP-S350 Blu-ray player is still available for £150, and you can pick up a Denon AVR-1509 AV receiver for £220. For this and other bargains, head on over to the Richer Sounds website.